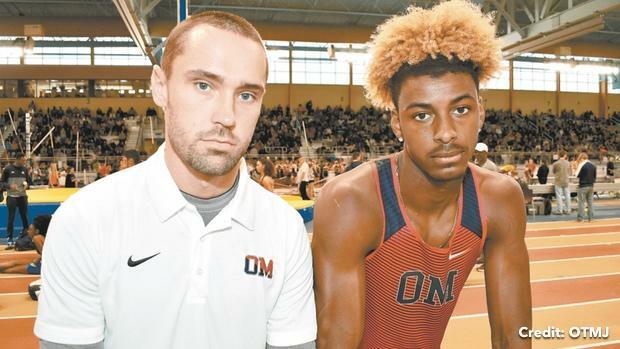 Among the more notable performances scheduled to take place at the Alabama High School Athletic Association Championships this weekend in Birmingham is a national-level attempt in the high jump. And so eyeballs will be cued on Trey Allen once he laces up for a chance to break Alabama's all-time best clearance in the event. His previous clearance of 7-feet in January puts the Birmingham Oak Mountain senior in line for a chance to break the Class 7A record of 6-8, last set by Carl Nesbitt in 2016, but he's still a quarter-of-an-inch shy of tying JuVaughn Blake's 7-0.25 mark from 2017 at New Balance Nationals Indoor. Allen currently owns the only 7-foot clearance in the country and a US No. 1 effort. But he's currently No. 2 all-time in Alabama, just behind Blake. Fortunately, all three of his clearances over the 2019 season have increasingly raised the bar. Allen has proceeded to inch higher and higher with each attempt, posting a mark of 6-10 on Dec. 8 at the Holiday Invitational before raising his clearance to 6-11 at the Ice Breaker Invitational on Jan. 5. Allen's recent 7-foot clearance came on Jan. 21 at the Martin Luther King Indoor Track Classic. Info: Igbinoghene is the top seed in the 60m with a best of 7.62. That stands just under the indoor state record of 7.66, which Lauryn Hall ran in 2017. This seems to be the event the future collegiate athlete will be focusing on over the running events on Friday as she looks to down another one of the state's top athletes, Nicole Payne. Igbinoghene is also entered in the 400m--and finished third in the event last year-- though she has yet to be down a truly great performance at the distance. Info: Stone is one of the state's best distance runners over its history, and he could land three state records over two days. He's the only athlete in the Class 6A 800m race seeded under 2-minutes (1:59.89) and will no doubt down the 2013 mark of 2:11.28. Over in the 3200m, Stone has run 9:15.14, which would be just under the state mark of 9:17.71 set back in 2005. But Stone's best event might be the 1600m, where his 4:19.04 is two seconds faster than the state record of 4:21.11 set back in 2012. The better question is whether Stone will race to an all-time Alabama best in the 1600m and 3200m. Those times different (see note above) from the state's indoor records and stand at 4:15.84 and 9:13.45. Stone certainly has a chance to surpass both marks. Info: Finch is in the territory of two state records in the jumps, though they're not clear just yet. Finch enters with top marks of 18-4.75 in the long jump and 38-4.50 in the triple jump. She remains just three inches shy of a state best in the long jump, but that record has been held since 1997 when Toyin Augustus marked 18-7.25. Finch's clearly the top candidate in Class 6A, with a mark over a foot better than the next best jumper, though she'll have to find rhythm over her series to make it happen. The triple jump record seems a little more safe, as Finch stands a little less than 2-feet from the state record of 40-4.25. However, Finch is also the clear favorite in that event with a three-foot lead based on entries. Info: She's fast becoming one of the state's best distance runners and in time could make a run for some of Amaris Tyynismaa's overall state records over the distance events. But first, the sophomore will look to win four separate races over two days at the CrossPlex. She enters as the No. 1 seed in all four events for the Class 1A-3A division and has a chance to break state records in the 800m (2:16.37) and the 1600m (5:07.36). Miles holds indoor personal records of 2:15.90 and 5:10.48 in each event. Info: The state triple jump record is in jeopardy with Taylor in the mix. The Northridge athlete has leapt to a top mark of 48-11 so far in 2019, which stands nearly a foot clear of the state record mark of 47-11.25, last captured by Myles Charley in 2012. It won't come easy, though. Unfortunately, Taylor's 48-plus mark was scatter shot of his season, which saw mostly 45-plus and one 46-11 triple jumps. Taylor has the potential to land a state record, and an overall win in Class 6A, but he'll need to work the same magic that saw him clear 48-plus at the Martin Luther King Indoor Track Classic on Jan. 21. Taylor will also look to capture a title in the long jump. Info: He's probably shy of the state record of 16-6.50, which was set in 2015 by Sean Collins, but Dolan will surely have a chance to be within striking distance of that height. On Saturday he'll be in a class of his own in the Class 7A pole vault. He enters as the only athlete to have broken 15 feet, and he currently sits just outside the nation's top 50 marks in the event. Dolan will get his chance to enter into the national ranks here. Info: She owns both the overall CrossPlex record in the 400m with a top time of 54.22 and the state record of 55.24, which she set in 2017, so her day could be about more than just winning. Payne looks in control to break her overall state record in the 400m, as she enters with a time of 54.88. But the Class 7A race has some talented contenders, such as Igbinoghene and Mountain Brook's Holli Chapman and James Clemen's Ashlee Osaji. It should be a race to the line in the quarter. Meanwhile, Payne is also entered in the 60m and is the second overall seed behind Igbinoghene.